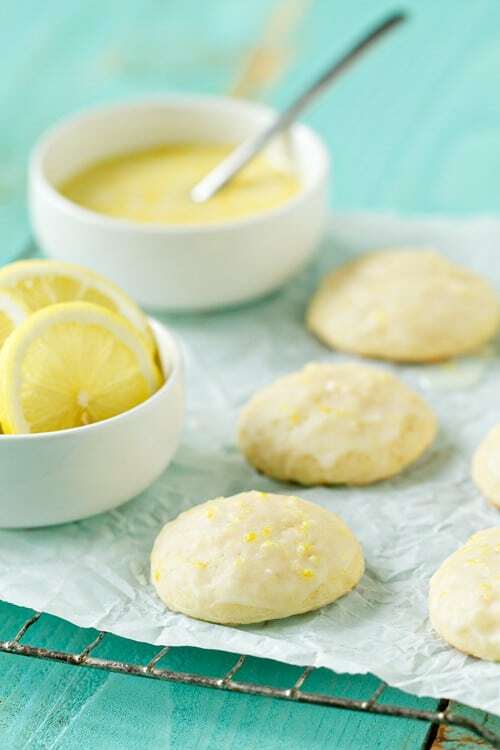 Tangy lemon ricotta cookies are topped with a sweet and tart lemon glaze that creates the perfect summer cookie for any celebration. Time flies. Our sweet baby is already 6 months old and I feel like it’s all going by way too fast. Sometimes I want to freeze moments in time and then there are moments when I can’t wait for her to crawl and call out for her mama. We just had her 6 month photo session and watching her adorable tu-tu wearing self sit up with a huge grin made me all kinds of emotional. She has so much personality – she’s happy, strong, and independent – pretty much everything that I’d wish for her to be. It’s all just flying by. And to be honest, it kinda makes my ovaries hurt. Summer also feels like it came and went with the blink of an eye. There’s a chill in the morning air that makes me crave fall and all the amazing things that come along with my favorite season. Sweaters, boots and pumpkin – loads and loads of pumpkin. However, much like I don’t want to rush Elle’s first year, I also don’t want to get into full on fall mood too soon. Although I’m dreaming about pumpkin rolls and pumpkin cream cheese muffins, I’ve decided to embrace the waning weeks of summer. What screams summer more than lemon? I am sharing Lemon Ricotta Cookies on Food Fanatic. They’re loaded with bright, fresh flavors and they’re dipped in a sweet lemony glaze that made my anti-lemon guy pop them into his mouth one after another. Seriously, he became a lemon lover after one of these cookies. If that doesn’t compel you to make these immediately, I don’t know what will! They’re sweet, tart little bites of sunshine and they’re perfect for any celebration. I adore these lemon cookies. They look light and delicious. Your site is beautiful as well! Oh, thank you! I appreciate you stopping by! Thanks Alyssa! I appreciate you stopping by! Me too, I love everything lemon. Thanks for stopping by! Such a yummy treat. These sound great! Thanks Katrina! I appreciate you stopping by! Oh yum! I’ve never baked ricotta cookies before. Can’t wait to try these out! I hope you try them Liz! Thanks for stopping by! Love the summery colors in these pics! And the cookies look so good too. Pinning to try soon! Oh yum, these look amazing! And yeah, nothing says summer like lemon! I want everything lemon these days. Thanks for stopping by! Freezing time is the answer. I do love the lemon and ricotta combo. Thanks for stopping by. These look delicious! As summer is wrapping up, what a perfect lemon-y treat! I can’t wait to try these! I hope you get a chance to try them! Thanks for stopping by! How scrummy do these look! I made a lemon loaf on the weekend – these are like the cookie version! Delicious! Your lemon loaf sounds wonderful. Thanks for stopping by! I have NEVER had ricotta in a cookie…but I ADORE putting it into pancakes, so why not! I love ricotta pancakes too. Thanks for stopping by! Have these been made with orange instead? You could substitute orange if you like. Thanks for stopping by. Ooo! I love the sound of these cookies! So pretty too! Thanks Anna! I appreciate you stopping by! Are these a soft cookie, and if so do they stay soft? Thanks so much, Sharon! Yes, they are a soft cookie. We had them on hand for 3 days and they remained soft. Thanks so much for stopping by! I love lemon flavoured desserts and these cookies look just divine! It wasn’t that long ago that I was hoping my children would grow older more quickly, now all I want to do is slow down the passing of time. Time goes way too fast, doesn’t it. Thanks so much for stopping by. I so wish summer was winding down here in Texas!! We still have at least 6 more weeks in the upper 90s to near 100. I do love these cookies though – they help take some of the edge off the blazing heat! Try to stay cool and thanks for stopping by! My mother-in-law has been making these Italian style cookies for years. They are one of my husbands favorites. About to send my son off to college, sniff sniff. Cherish these years as they are gone in a flash!! We loved these cookies too. Thanks for stopping by! These bring back great memories. This was something my grandma and I would bake together. It was our special recipe. What a special memory, thanks for stopping by to share it. I have not attempted to freeze these cookies. They are cake-like in texture, so I would be very careful when storing in the freezer. I hope this helps. Oh yum! Lemon cookies are amazing in the summertime! Thanks so much Heather! I appreciate you stopping by. These cookies look lovely, could you not ise ricotta cheese in them to just make a plain lemon cookie? You will need to use a substitution if you can not find ricotta cheese. Cottage cheese or farmers cheese would be an acceptable substitution. Thanks for stopping by. These look delicious! Have you, or anyone else, tried them with key limes, or oranges? It seems like it could be a good recipe to substitute. I haven’t, but I bet they would be amazing. Let me know if you give it a whirl. I just made my first batch and they are fantastic!!!!! Great cookie! My question is how do you store them? Does the frosting get hard enough where you’re able to stack them? The glaze will harden up quite nicely. I made these during the summer, so I stored mine in the refrigerator, I think they’ll do just fine at room temp too. Thanks for visiting! Can you use Meyer lemons for these cookies? I think that would be pretty darn delicious! Thanks for stopping by! I’m so glad the recipe was a success for you! Thanks for stopping by! Hi. I’m not sure if you’ll see this but I’ve made these quite a bit and they always turn out delicious. However, I had a question about preparing them in advance. Can you freeze them once they’ve cooled the. Glaze them a few days later? I’m making them for a bridal shower this weekend and since they’re pretty time consuming (and so are my other dishes) I was hoping to make them this week, cool them, freeze them, then glaze them the day of the shower. What would you suggest? Thanks in advance! These are my absolute favorite cookies ever!!!! I think as long as you freeze them in a single layer and glaze them before serving, they’ll be great. As always, I recommend you do a test run before a big event – like a bridal shower. I hope this helps. I have no idea why lemons are considered a summer food – maybe b/c they taste so light and fresh? Many of us in AZ have an abundance of them as trees are full of ripe lemons now (February), and are looking for ways to use them. I’ve made these cookies twice in the past 2 weeks – they are delicious and receive rave reviews! So happy to hear you enjoyed the recipe – they are still one of my favorite cookies! Thanks so much for stopping by and leaving your feedback. I don’t know if this is a dumb question or not but for the lemon zest for the cookies and the glaze, how much lemon zest do you mean? I know for the cookies you say 2 lemons zested, do you mean the entire lemon? Or like 1 tablespoon of zest? Same for the glaze. Please and thank you! Hi, Hima! This isn’t a dumb question at all! The entire lemon should be zested. Let me know if I can answer anything else! I’m so glad you enjoyed them, Menka! Happy birthday to your grandson! Love these cookies! But sometimes I have a problem with them spreading. I have taken to popping them in the freezer before I bake them. Any suggestions as to what the problem might be — other than the hot, humid Texas weather? Hi, Jean! The Texas heat may be contributing to the spreading. How long are you freezing the cookie dough? I would do it for a long time and see if that helps. Also maybe cutting down on the mixing time of all the ingredients just a bit, just making sure everything is combined well. I hope this helps! I’m glad you liked them, Jean! Let me know the outcome if you try them again! 2 tablespoons made my cookies HUGE.. Do you mean teaspoons? Hi, Denise! Each stick of butter weighs 1/4 pound/4 ounces/110g. I hope you enjoy the cookies! Hi I just found this recipe. I live in spain and ricotta is not easy to find. Could I use cream cheese? I bake a lot and lemon seems to be favourite here. Thanks jacqui. Hi, Jacqui! If you can find cottage cheese or fromage blanc, you can probably substitute those.You could also try making Homemade Ricotta. Good luck! If you add vanilla bourbon extract or almond extract (just a tad), it takes these lemon ricotta cookies to another level. Also, you can do a double dip on the glaze if you want it more tangy and less sweet (cut sugar and itll be a bit thinner, then when it hardens, dip it again for 2 thin, less sweet coats). Just make sure you don’t make it too thin as to not soggy up your fluffy cookie! Thanks so much for the tips, Sau! Hi, could you pls help me with the weight of ricotta? Im fm Argentina and we dont measure with ounces. Hi, Melisa! Fifteen ounces of ricotta is about 425 grams. I hope you enjoy the cookies! I’m so glad to know that Beatrice! I want to make these in advance for my neice’so shower. Can I freeze these for a Month? Will they be okay In a cookie box for 4 days? Hi, Michelle! I think you could freeze these for a month. Store them in an airtight container for freezing, and save the glazing until after you thaw them. I hope your niece enjoys them! Hi, Monita! You could try cottage cheese as a substitute. I hope you enjoy them! How much is one container of milk? Hello! The recipe calls for a 15 ounce container of whole-milk ricotta cheese. Thanks! 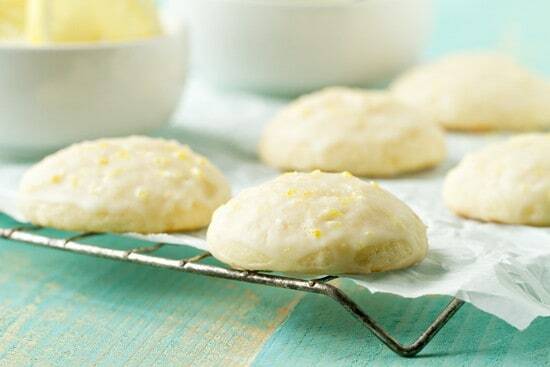 Quite simply put…..these lemon ricotta cookies are an addiction. Gave some to my mother and she actually hides them in the fridge LOL which when eaten a little chilled are a refreshing treat. Everyone goes nuts over them!!! I’m glad other people hide food in the fridge! So glad to hear you and your mom enjoyed them, Rick! Can I freeze these cookies ? I have never frozen these cookies, so I am not sure how they will keep in the freezer. Hopefully someone will chime in and answer your question. Thanks so much for stopping by! Happy Baking! I must say that I absolutely LOVE these cookies. And so do many others. I get requests for these regularly! Thank you! Thanks so much, Terry! I am so happy to hear you enjoy them! Happy Holidays to you and yours! I’ve made these cookies for a few years now. I love them. However sometimes when I make them they spread thin and leak out. Then whatever leaks out burns. Do you know why this is? Hi Chad – I’ve never had this issue so I’m not sure what might be happening. Do you always make sure to use whole milk ricotta? If not, I wonder if that could be the issue. I am glad to hear you love the cookies, though! Happy baking.